Digestive issues can be embarrassing (if they're happening to you), or hilarious (if they're happening to someone else). As funny as farting is, no one wants to admit they were the person who just crop-dusted the entire office right before lunch. On the more extreme ends of the spectrum, running to the bathroom every 10 minutes to relieve yourself isn't much fun, nor is waiting in vain for a poop that refuses to come. The semi-silver lining? Your digestive system is designed to handle (most of) the abuse it takes, provided you treat it right. While it's tempting to sprint to the nearest drugstore and down an entire container of TUMS, your first stop should be your kitchen. "Food should always be your first line of treatment for any gastrointestinal problems," says Dr. Su Sachar, a board-certified gastroenterologist. She says she often relieves patients of symptoms simply by changing their diet, rather than resorting to prescriptions or other meds. Read on for her advice and other science-backed suggestions on what to eat to soothe a screwed-up stomach. When you're stopped up, focus on fiber. You're probably not getting enough of the recommended 22 to 34 grams per day. 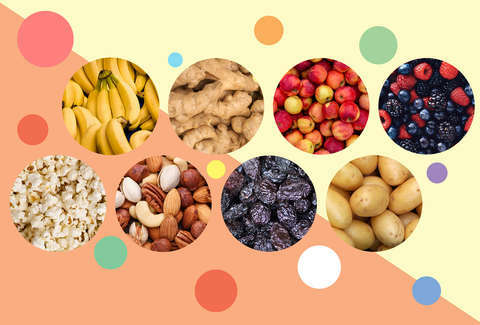 To help move things along, Sachar says to reach for foods that contain insoluble fiber, which doesn't get digested by the GI tract and passes through your gut, acting as a natural laxative. With about five grams of fiber in one, an apple a day keeps constipation away. Keep in mind that juice doesn't count; the insoluble, bulk-forming fiber you want, called pectin, is located in the skin of the apple. Berries are also a good bet -- grab a handful or use them to top yogurt or (high-fiber!) cereal. Raspberries (eight grams of fiber per cup) and blackberries (7.6 grams per cup) have the most bang for your buck. Not that you need another reason to Netflix and chill, but popcorn is also a great way to help you poop. Unfortunately, that bag of Orville Redenbacher's you've had in your pantry for three years isn't going to cut it. "Microwave popcorn has 30% less fiber and about 80% more sodium than air-popped," Dr. Sachar says. Plus you'll miss out on the potentially harmful chemicals found in the flavoring of the conventional kind. Here's an easy way to air-pop kernels at home. In case you didn't know, the gross-sounding "prunes" your grandparents ate have been rebranded as "dried plums" by savvy marketing teams, but they still work the same magic. This is thanks to their plentiful soluble and insoluble fiber (six grams per half cup) and sorbitol, a non-digestible sugar alcohol with laxative effects, Sachar explains. Research even determined prunes to be more effective than psyllium (think: Metamucil) and should be considered a "first line therapy" against constipation. In particular, Sachar recommends Brazil nuts, peanuts, and walnuts for their poop-producing power. Along with fiber, these varieties contain a hefty dose of nutrients like protein and healthy fats. 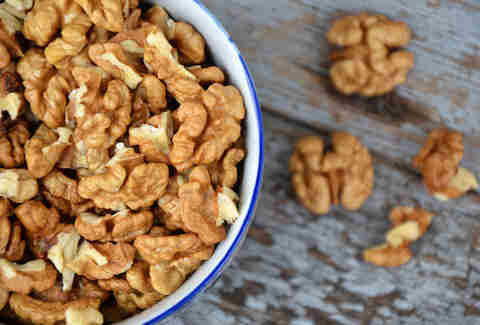 Stick to a handful of nuts per serving so you don't go overboard on calories, which can add up fast. Full of insoluble and soluble fiber, these tiny seeds deliver a big benefit for your digestive tract and can help relieve constipation. Two words to the wise: make sure the seeds are ground, not intact (they'll pass right through you), and drink tons of water. If you don't have enough liquid in your system, flax may have the opposite effect. Can't button your pants at the end of the day? No, you didn't just gain 10lbs, but that plate of pasta you had for lunch may be to blame. As Sachar points out, there's no one-size-fits-all solution to these types of GI issues. If you have continuous digestive problems, you might want to try an elimination diet to see which foods you can tolerate and which you can't. In the meantime, these foods might just help your blown-up gut. Flavorful plants like fennel, oregano, and peppermint work wonders on gas and bloating, Sachar says. They help by naturally decreasing the spasms of the muscular lining of the intestine, relaxing overworked bowels. 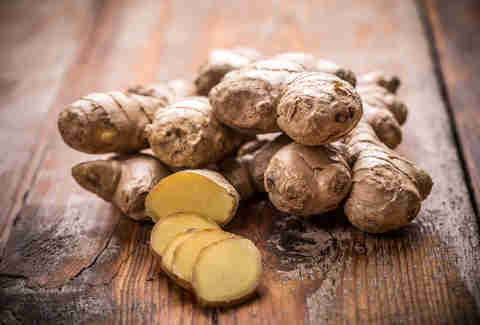 Ginger is also a good choice: it "accelerates gastric emptying," which means exactly what you think. Drink it in hot tea, or add it to soups or stir-fries. Just make sure you're buying it fresh, not pickled, the kind they serve with sushi. Getting the runs can be a result of a bacterial infection, in which case the problem is short-lived and usually resolves itself within a day or so, according to Sachar. Not so reassuring in the moment, though! Foods that require some sort of bacterial activity to make -- think yogurt, kimchi, miso, kombucha, and sauerkraut -- contain probiotics, which help calm down an overactive digestive system, Suchar says. In fact, recent research shows probiotics help shorten a bout of diarrhea by about one day. Anyone who's had a bad case knows that 24 hours may as well be a week. While you want to be careful with raw veggies that can irritate your system, these two are rich in soluble fiber, which acts like a sponge in your intestines, Suchar says. "It helps sop up everything in the way to create a more formed bowel movement." More formed bowel movements are your goal, people. Keep things simple. If your mother ever made you follow the classic cure for diarrhea, known as the BRAT diet (bananas, rice, applesauce, and toast), she was actually onto something. 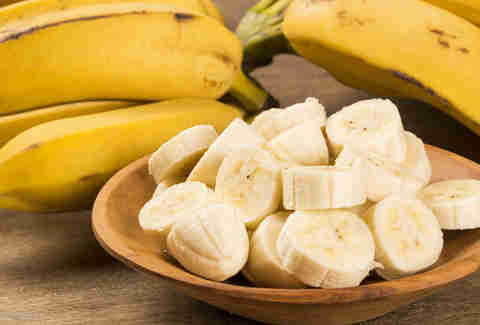 Bananas contain beneficial soluble fiber, including inulin, a prebiotic that also promotes the growth of good bacteria in the gut. They also have the added benefit of potassium, which helps restore nutrients that you lose after all that time on the toilet. As your system starts to settle down, you're going to want to build up your energy levels with some protein. Opt for cooked, skinless chicken, turkey, or lean steak, which can all help you avoid fatigue that can be yet another unfortunate side effect of diarrhea. Locke Hughes is a freelance writer who doesn't recommend eating all of these foods at a single meal.